NOTE: An extended version of this book which includes decorative sewing techniques is available here. Bangles, bracelets, necklaces, fobs for keys and tools, shoe laces, straps and drawstrings for pouches, lanyards and eye-glass holders... These are just some of the things that can be made using the woven patterned tubular band that I teach in this book. 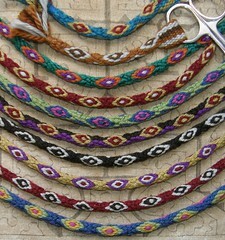 The bands can be as subdued or as colorful as you like using a minimum of two, or up to five and even more colors. When I was first learning to weave with my indigenous teachers in Bolivia and Peru, I had thought that removing the cloth from the loom was cause for great celebration. I soon realized that this signaled the end of just one part of the process and a whole new beginning of another which involved finishing the pieces with a series of colorful embellishments, such as the beautiful eye-pattern tubular band. The band is dotted with multi-color diamond or "eye" shapes, (ñawi, in the Quechua language of the Peruvian and Bolivian highlands). Dozens of step-by-step photos, diagrams, and drawings in this book will take you through the process of weaving these pretty bands as independent tubes. Traditionally, the warp for these bands is attached to the weaver's waist, or even more simply, suspended between a finger and toe! However, when it is woven as an independent tube, the warp for the band can be easily set up and worked on an inkle loom or any other loom or frame that can be adjusted to allow for take-up. 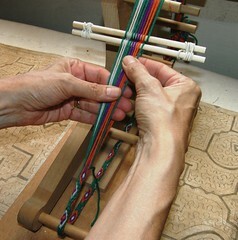 Full instructions for weaving the eye-pattern band as an independent tube on an inkle loom are included in the book. In the Appendix, I show how the method for weaving the independent tube can be adapted to better suit left-handed weavers. The tutorials show various ways to finish the bands and also how to use findings to create jewelry pieces and fun accessories. On checkout, you will be able to view and download the video segments, if you like. They have been designed to supplement and reinforce the thorough explanations in the book and are optional bonus materials. They are best viewed after you have read the tutorials in the book. I hope you enjoy them! THE VIDEOS ARE mp4 FILES AND CAN BE VIEWED ON iPHONES, ANDROID DEVICES, iPADS, iPODS, LAPTOPS ETC. If you would also like to learn to use the eye-pattern band in the more traditional way in which it is simultaneously woven and sewn to the edge of cloth, a longer version of this book, which includes these instructions, is available here. The longer version also has tutorials on two more decorative sewing techniques that are used by highland weavers to embellish their cloth. It includes bonus supplemental material on video for all these techniques. I have so enjoyed learning and using these finishing techniques in my work over the years, as well as sharing them with other weavers. It has also been fascinating traveling and discovering the various regions in which these techniques are used while observing and trying the different methods that are employed. I hope that you will find many uses for the tubular band in your own projects.